SSB-120 is a PA mixer amplifier of rated output 120 Watts. This, combined with 6 Microphones inputs, 2 Aux inputs, and provision for multiple speaker connections makes this product ideally suited for a variety of music programmes and public address applications. In addition ±10dB Cut/Boost Bass/Treble controls and AC/12V battery operation are provided. Cut and Boost type Bass & Treble controls. 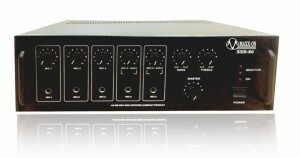 SSB-100 is a PA mixer amplifier of rated output 100 Watts. This, combined with 5 Microphones inputs, 2 Aux inputs, and provision for multiple speaker connections makes this product ideally suited for a variety of music programmes and public address applications. In addition ±10dB Cut/Boost Bass/Treble controls and AC/12V battery operation are provided. SSB-80 is a PA mixer amplifier of rated output 80 Watts. This, combined with 5 microphone inputs, 2 Aux input, and provision for multiple speaker connections makes this ideally suitable for a variety of music programmes and public address applications. In addition Bass/Treble controls and AC/12V battery operation are provided. 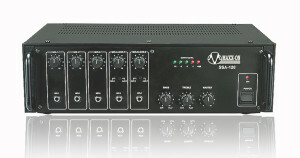 SSB-60 is a PA mixer amplifier of rated output 60 Watts. This, combined with 4 microphone inputs, 1 Aux input, and provision for multiple speaker connections makes this ideally suitable for a variety of music programmes and public address applications. In addition Bass/Treble controls and AC/12V battery operation are provided. SSA-120 is a PA mixer amplifier of rated output 120 Watts. This, combined with 5 Microphones inputs, 2 Aux inputs, and provision for multiple speaker connections makes this product ideally suited for a variety of music programmes and public address applications. In addition ±10dB Cut/Boost Bass/Treble controls and AC/24V battery operation are provided. 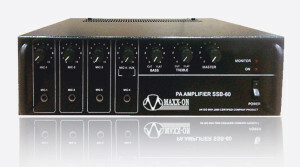 SSA-100 is a PA mixer amplifier of rated output 100 Watts. This, combined with 5 Microphones inputs, 2 Aux inputs, and provision for multiple speaker connections makes this product ideally suited for a variety of music programmes and public address applications. In addition ±10dB Cut/Boost Bass/Treble controls and AC/24V battery operation are provided. 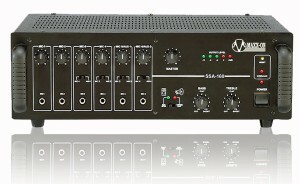 SSA-160 is a PA mixer amplifier of rated output 160 Watts. This, combined with 6 Microphones inputs, 2 Aux inputs, and provision for multiple speaker connections makes this product ideally suited for a variety of music programmes and public address applications. In addition resettable circuit protector, ±10dB Cut/Boost Bass/Treble controls and AC/24V battery operation are provided. 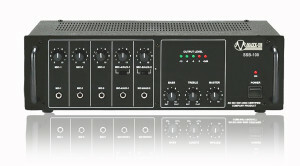 Line Input for connecting the output from any external mixer or permitting SSA-160 to be used as a Booster Power Amplifier.